Liberty Hyde Bailey (1858-1954) was an American horticulturist, botanist, and co-founder of the American Society for Horticultural Science. Born in South Haven, Michigan, he was educated and taught at the Michigan Agricultural College (now Michigan State University) before moving to Cornell University in Ithaca, New York, where he became dean of the Cornell University College of Agriculture and Life Sciences. He is known as the Dean of American Horticulture. He edited The Cyclopedia of American Agriculture (1907-09), the Cyclopedia of American Horticulture (1900-02), and the Rural Science, Rural Textbook, Gardencraft, and Young Folks Library series of manuals. He wrote scores of books, including scientific works, efforts to explain botany to laypeople, a collection of poetry, and coined the word cultivar. Cornell University memorialized Bailey in 1912, when Bailey Hall, the largest building on campus, was dedicated in his honor. Bailey is credited with being instrumental in starting agricultural extension services, the 4-H movement, the nature study movement, parcel post, and rural electrification. He was considered the father of rural sociology and rural journalism. Approximately 140 years after his birth, the Liberty Hyde Bailey Scholars Program was created at Michigan State University, the institute of higher learning where Bailey began his career. The Bailey Scholars Program incorporates L.H. Bailey's love of learning and countless expressive learning styles to provide a safe, nurturing space for students to become educated in fields that interest them. The credo of the group is: "The Bailey Scholars Program seeks to be a community of scholars dedicated to lifelong learning. All members of the community work toward providing a respectful trusting environment where we acknowledge our interdependence and encourage personal growth." Bailey's father, Liberty Hyde Bailey, Sr. moved to southern Michigan in 1842, and married Sarah Harrison in 1845. Liberty Hyde, Jr., was their third and youngest son. Typical of pioneer families on the frontier, the Bailey family made their living from the land. They cleared woods, built a farm and planted an orchard, and produced much of their own food and clothing. Dairy products and eggs, maple sugar, and wood provided for much of the their income. Bailey's father worked off the farm and earned additional money to improve it. In 1854, the Baileys moved to South Haven at the mouth of the Black River, settling on an 80 acre plot of land where Bailey was born in 1858. When he was three years old, along with his two older brothers, Bailey contracted Scarlet fever. His eldest brother, Dana, died from the fever. Also stricken with scarlet fever and bereft over the loss of her oldest son, his mother, Sarah, died the following year, 1862. The following year, Bailey's father married a young woman from a neighboring farm, Maria Bridges. Bailey and his sons, Marcus and Liberty, were skilled and innovating farmers, and their farm was known for its prize-winning apples. Bailey and his father were charter members of the newly organized South Haven Pomological Society. One of their orchards won a first premium as a model orchard, perfect in "culture, pruning, and fruitfulness." Eventually, the orchards included over 300 cultivars. Even as a youth, Bailey became an expert on grafting. His skills were in great demand among his neighbors. The word cultivar was coined by Bailey from "cultivated" and "variety," but is not interchangeable with the botanical rank of variety, nor with the legal term "plant variety." When he was 15 years old, Bailey presented a paper, Birds, to the South Haven Pomological Society and later to the Michigan Pomological Society. It was his first public speech. He was subsequently elected lead Ornithologist of the South Haven Pomological Society. 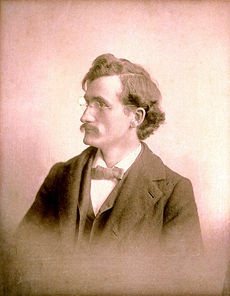 Liberty Hyde Bailey was educated in the local school, where his teacher, Julia Fields, taught him grammar, geometry, and Latin, and encouraged his interest in nature. He was also influenced by the books his father bought and read, including the Bible, Pilgrim’s Progress, John Milton’s poems, and especially, Charles Darwin’s On the Origin of Species, and Asa Gray’s Field, Forest, and Garden Botany. Bailey attended Michigan Agricultural College in Lansing, Michigan, from 1878 until 1882. His studies included Botany under the Dr. William Beal. While at college, he met his future wife, Annette Smith, and they became engaged. On August 15, 1882, he graduated from Michigan Agricultural College with a Bachelor of Science degree. Following graduation, he moved to Springfield, Illinois, and took up work as a reporter for the daily newspaper, Morning Monitor. While there, his former college professor, William Beal, recommended him to Harvard botanist Asa Gray, who took a liking to Bailey and invited him to Cambridge, Massachusetts. Bailey moved to Cambridge to work as Gray's assistant in February 1883. On June 6, Bailey married Annette Smith in Michigan. Bailey's work with Asa Gray was successful and his reputation as a botanist grew so that he accepted a position in 1885, as Professor of Horticulture and Landscape Gardening at Michigan Agricultural College. He published his first book, Talks Afield: About Plants and the Science of Plants, written to help people identify common plants which was put out by Houghton Mifflin. In 1886, Bailey received a Master of Science degree from Michigan Agricultural College. That year he went to work for a federal government geological survey of Minnesota. The next year, his first child, a daughter, Sara May Bailey was born on June 29, 1887. That winter, Bailey was invited to give a series of lectures at Cornell University. The next year, from August 1888 until early 1889, Cornell sent Bailey and his family to Europe on a horticulture research trip. When he returned, he began work as a Professor of Practical and Experimental Horticulture at Cornell University. His second daughter Ethel Zoe Bailey was born on November 17, 1889. In 1893, Bailey delivered his Agricultural Education and Its Place in the University Curriculum address. In it, he declared, "The State must foster it." As a result, the New York State Legislature appropriated $50,000 for the construction of a Dairy Husbandry building at Cornell University. From there until 1890, Bailey developed Cornell's Extension work. His impressive efforts caused New York State to grant Cornell University Experiment Station money for research. Bailey's long-time mentor, Asa Gray, published a new edition of Field, Forest, and Garden Botany in 1895, and offered it to Bailey. He offered Gray his revisions, which Gray accepted. From the late 1890s into the early 1900s, Bailey began Nature Study and Rural School courses with John Spencer and Anna Botsford Comstock and in the summer of 1899, he appointed Anna Botsford Comstock as Cornell's first female professor. In 1900 until 1902, Bailey undertook editing Cyclopedia of American Horticulture, becoming its main contributor. Bailey published a collection of essays on education in 1903, titled The Nature-Study Idea. The next year, he lobbied the New York State legislature again and succeeded in getting a bill for the establishment of a State College of Agriculture at Cornell University passed. In acknowledgment Cornell University names Bailey Dean of the College of Agriculture. From 1904 through 1913, Bailey established a variety of departments in the College of Agriculture, including plant pathology, agronomy, poultry husbandry, agricultural economics, farm management, experimental plant biology (plant breeding), agricultural engineering, and home economics. Groundbreaking for Roberts Hall, the building for the New York State College of Agriculture began on May 1, 1905. Bailey's work in conservation and agriculture attracted the attention of U.S. President Theodore Roosevelt. In 1908, Roosevelt asked Bailey to lead The Country Life Commission to investigate the status of rural life in the United States. Bailey initially refused the request but after much consideration accepted the position. The next year, Bailey completed his work as editor and contributor to the Cyclopedia of American Agriculture and began a sabbatical year in which he traveled to Europe. Upon his return, in 1911, he appointed Martha Van Rensselaer and Flora Rose as professors in Home Economics in the College of Agriculture. Bailey retired as Dean of the New York State College of Agriculture in 1913. Bailey initiated his retirement by beginning a herbarium at his home on Sage Place in Ithaca, New York. Well known and respected across the academic world and especially in New York, Bailey was elected president of the New York State Agricultural Society in 1914, and invited by the government of New Zealand to deliver a series of lectures there. Traveling the world became part of Bailey's legacy. From 1914 to 1917, he made several plant collecting trips to South America. He also revised the Cyclopedia of American Horticulture, and saw the work republished as Standard Cyclopedia of Horticulture. Bailey continued his professional writings and in 1915, published The Holy Earth, a book of his philosophies on life, agriculture, and the world. The next year he published a collection of his poetry, titled Wind and Weather. In 1917, He began traveling the world in earnest, visiting China, Japan, and Korea. After two years in the orient, Bailey returned to Europe for a year. He then went on, from 1920 into 1921, traveling to Trinidad and Venezuela on a palm collecting trip. Returning to Ithaca, he accepted the position and served as president of the American Pomological Society. Continuing to write Bailey penned The Apple Tree, later in 1921. Fascinated by the research on Caribbean palm trees that he conducted in Trinidad and Venezuela Bailey went abroad again in 1922, collecting palms in Barbados. He succeeded Michael Pupin as president of the American Association for the Advancement of Science in 1926, and that year was elected president of the Botanical Society of America. In 1930, he published Hortus, a guide to cultivated plants in North America. In 1931, he presided over the first National Conference on Rural Government. Still engrossed in the study of palms, he traveled again to the Caribbean, this time to Jamaica and the Panama Canal zone on another palm collecting trip. He continued his research with palm trees in 1934, traveling to Mexico. Now 32 years in development Bailey gave his herbarium and its library to Cornell University in 1935. He is quoted as saying, "Call it an Hortorium … A repository for things of the garden—a place for the scientific study of garden plants, their documentation, their classification, and their naming." Later that year, his oldest daughter, Sara, died. His younger daughter, Ethel Zoe, accompanied Bailey on collecting trips until 1938. His palm research concluded, but his love of plants undying, in 1937, Bailey traveled again to the Caribbean, visiting Haiti and Santo Domingo collecting plants as he went about the islands. The next year in March 1938, his wife of 55 years, Annette, died. Later that year, Bailey returned to the Caribbean to study the plants of the French West Indies, Guadeloupe, and Martinique. Learning of yet another species of palm tree, two years later in 1940, he went to Oaxaca, Mexico, to find the Sabal mexicana palm. In 1944, Bailey's idea for a campus arboretum, botanical garden, and research field is realized with the opening of the Cornell Plantations. Satisfied that his dreams for ongoing hortocultural research was secure at Cornell, Bailey left once more and from 1946 to 1947, he collected plants in the Carribean and South America. So engrossed in study abroad was Bailey, that on March 15, 1948, he missed his 90th birthday party in Ithaca because he was on a plant collecting trip in West Indies. He returned to attend the celebration, which was rescheduled for April 29. Baileya, "A Quarterly Journal of Horticultural Taxonomy" was first published by the Liberty Hyde Bailey Hortorium. On December 25, 1954, Liberty Hyde Bailey died at his home in Ithaca. We have another son a full Blooded Yankee boy… Mother said to Sarah if she ever had another one she wanted to name it… we sent to her for a name… we think it will be L.H. Junior… the boy smart and bright as a dollar…born the 15 of March and weighed 7 1/2 lbs. The Bailey Scholars Program seeks to be a community of scholars dedicated to lifelong learning. All members of the community work toward providing a respectful trusting environment where we acknowledge our interdependence and encourage personal growth. Bailey placed great emphasis on the education of women. Inspired by, or naturally gravitating to, the spirit of the suffragette movement which found fertile ground in central New York, Bailey believed women could make a significant contribution as professors in the field of horticulture. He appointed several women to professorships at Cornell University's College of Agriculture including Anna Botsford Comstock as Cornell's first female professor, Martha Van Rensselaer and Flora Rose as professors in Home Economics. It was in 1886, that Bailey realized the necessity of photography as a tool in his work. Bailey's thousands of photographs which have been preserved testify to his innate aesthetic sense. Many of the images are simply works of art. In recent years, his photographs have been displayed in museums of art, including the Museum of Modern Art in New York City. Nature cannot be antagonistic to man, seeing that man is a product of nature. I like the man who has an incomplete course…. If the man has acquired a power for work, a capacity for initiative and investigation, an enthusiasm for the daily life his incompleteness is his strength. How much there is before him! How eager his eyes! How enthusiastic his temper! He is a man with a point of view, not a man with mere facts. This man will see first big and significant things; he will grasp relationships; he will correlate; later he will consider the details. Is there any progress in horticulture? If not, it is dead, uninspiring. We cannot live in the past, good as it is; we must draw our inspiration from the future. We must tell it to the world that the higher education is necessary to the best agriculture. We must tell our friends of our enthusiasm for the generous life of the country. We must say that we believe in our ability to make good use of every lesson which the University has given us. We must say to every man that our first love is steadfast, our hopes are high, and our enthusiasm is great. Our hearts are so full that we must celebrate. Humble is the grass in the field, yet it has noble relations. All the bread grains are grass—wheat and rye, barley, sorghum, and rice; maize, the great staple of America; millet, oats, and sugar cane. Other things have their season but the grass is of all seasons … the common background on which the affairs of nature and man are conditioned and displayed. Fact is not to be worshiped. The life which is devoid of imagination is dead; it is tied to the earth. There need be no divorce of fact and fancy; they are only the poles of experience. What is called the scientific method is only imagination set within bounds…. Facts are bridged by imagination. They are tied together by the thread of speculation. The very essence of science is to reason from the known to the unknown. ↑ The Bailey Scholars Program, Homepage. Retrieved November 17, 2007. ↑ Purdue Univesity, Plant Nomenclature. Retrieved November 18, 2007. ↑ Country Life Commission, Liberty Hyde Bailey, A man for all seasons. Retrieved November 21, 2007. ↑ Cornell University, Biography. Retrieved November 21, 2007. ↑ Cornell University, Letter from Liberty Hyde Bailey, Sr. to his parents, March 22, 1858. Retrieved November 21, 2007. ↑ Cornell University, Women in Education. Retrieved November 21, 2007. ↑ Cornell University, Photography. Retrieved November 21, 2007. Dorf, Philip. Liberty Hyde Bailey; An Informal Biography. Ithaca, NY: Cornell University Press, 1956. Fairchild, David. Liberty Hyde Bailey. 1941. Rodgers, Andrew Denny. Liberty Hyde Bailey; A Story of American Plant Sciences. Princeton: Princeton Univ. Press, 1949. Liberty Hyde Bailey, A Man for all Seasons. Cornell University College of Agriculture and Life Sciences. History of "Liberty Hyde Bailey"
This page was last modified on 5 July 2018, at 18:44.